It’s that time of year when grading is on an academic’s mind. With first-year assignments still fresh in my head, I recently found myself frustrated by Sir Hans Sloane’s “Account of Symptoms arising from eating the Seeds of Henbane” (Philosophical Transactions, volume 38, 1733-4). Letters by Sir Hans rarely feature on this blog—and that’s for a good reason: there aren’t very many by him in his correspondence collection. But he did, occasionally, send in reports to the Royal Society… some of which were better than others. I love reading the early eighteenth-century Philosophical Transactions; many of the authors knew how to tell a cracking story, with a clear narrative arc of event, evidence and interpretation. Not so much this offering from Sloane. 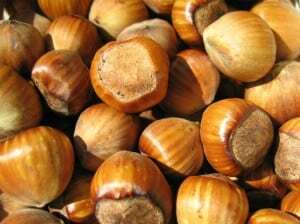 Filberts. Credit: Agnieszka Kwiecień, Wikimedia Commons. This could have made for a solid medical case study: who better to bring together clinical observation with botanical detective work? But for Sloane, the real story was the seeds rather than his diagnostic prowess. I withheld judgement. At this point, I was curious to see where Sloane, the narrator, would take his readers. Four poisonous plants: hemlock (Conium maculatum), henbane (Hyoscyamus niger), opium lettuce (Lactuca virosa) and autumn crocus (Colchicum autumnale). Credit: Wellcome Library, London. Sloane went on to describe how the symptoms of delirium can offered important clues. Henbane delirium was very different from regular fevered delirium, but had much in common to the delirium caused by datura (“a species of stramonium”) and bang of East-India (“a sort of hemp”–indeed). Unfortunately for the reader, he did not describe any of these forms of delirium. A sculpture of a man with toothache. Wood engraving after Mr. Anderson. Credit: Wellcome Library, London. Henbane wasn’t all bad, though. Sloane recounted, for example, that several years before, a “Person of Quality tormented with this racking Pain [of tooth-ache]” was treated by an empiric who used henbane. The sufferer was desperate—“his Anguish obliging him to submit to any Method of procuring Ease”—and he allowed the empiric to funnel smoke into the tooth’s hollow before (allegedly) removing tooth-worms. If this case sounds familiar to regular readers, it should be. Sloane procured one of the maggots from the sufferer, then sent it to Leeuwenhoek who examined it in detail and found it to be an ordinary cheese worm rather than a so-called tooth-worm. There is much of interest in this paper: your medical cases on henbane and tooth-worms are intriguing and your ability to identify both seeds and poisoning is impressive. I also appreciate the historical perspective that you bring to this study with your discussion of witch ointments. However, there are a few ways in which this essay could be strengthened. The essay lacks analysis as you move quickly between subjects–a recent case, types of delirium caused by different seeds, and an old case. These are all fascinating issues in their own right, but you lapse into storytelling with each instance without ever going into detail about their significance. For example, in the middle section, you aim to connect different seeds to different types of delirium, but you never provide any discussion about the specifics (apart from the witches’ delirium): how did the childrens’ delirium present? What does delirium caused by bhang or datura look like? In what ways are each of these similar or different? This would help the reader to understand your thought process in diagnosing the patients and in identifying poisons. It is also worth more carefully considering the title you’ve chosen: “An Account of Symptoms arising from eating the Seeds of Henbane”. A good title should reflect the content of the essay. However, only the first section of your paper considers symptoms actually caused by eating henbane seeds. The second section is potentially related, but needed to be more closely linked to make the connection clear; this would have been done to good effect by comparing the specifics of each drug and their symptoms to the case of henbane poisoning you introduced. The third section is only tangentially related—although you discuss a medical case and henbane is involved, you consider henbane’s therapeutic qualities rather than symptoms arising from its use. You could usefully have omitted the case in its current state, particularly since the section focuses on making value judgements about empirics and examining tooth-worms. That said, if you really do think it necessary to keep the section, you needed to consider henbane’s effects in more detail. Even more crucially, you might consider changing the title: “An Account of the Effects of Henbane” would have neatly pulled the three strands together in a more coherent fashion. This essay has the potential to be a wonderful example of your diagnostic and botanical mastery, especially if you took more time to consider the narrative arc. Rather than scattering your energies by telling several stories (henbane, witches or tooth-worms), focus instead on one strand. Don’t be afraid to toot your own horn by showing off what you know and how you know it, instead of just sharing a collection of interesting tidbits. So what grade should we give it…? On Monday 28th September at 1:45pm, BBC Radio 4 aired the first segment of their ten-part series about Natural History Heroes and what would be my very first foray into sharing my research on national radio. It was a lot more nerve-racking than I expected, but also an interesting learning experience. Iplayer Radio, BBC Radio 4. Image Credit: BBC. In April of this year (2015), the Natural History Museum (NHM) announced a BBC Radio 4 Natural Histories series. This would be a partnership that would ultimately allow the NHM to share extraordinary stories surrounding their vast collections, as well as the expertise of its scientists. The second element of this collaboration–Natural History Heroes–would then allow a range of experts from the Museum to select and discuss predecessors who inspired their work and lives. Finally, four prominent authors will write original short stories inspired by the incredible narratives uncovered during this partnership. Wonderfully (and quite rightly! 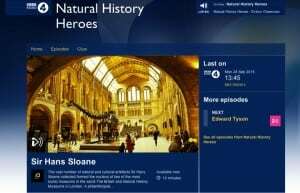 ), Sir Hans Sloane was chosen to be the first Natural History Hero. Senior Curator of the British and Irish Herbarium at the Museum, Dr Mark Spencer, spoke charmingly about the incredible Sloane Herbarium. This is currently housed in the Historical Collections Room in the Museum’s Darwin Centre. This purpose-built space, kept at a strict seventeen degrees Celsius, holds Sloane’s collection of ‘Vegetable Substances’–my obsession for the last three years. Because of my PhD research on the collection, Mark invited me to be part of this programme. In July, the programme’s producer, Ellie Sans, contacted me. Ellie and I talked at length over the phone about the historical research I’ve been doing with the vegetables, particularly my interest in the people who sent botanical material from all over the world to Sloane in London. Ellie was particularly interested in the larger project that surrounds Sloane: Reconstructing Sloane (as well as Reconnecting Sloane) and the significance of this collaborative research. Mark recorded his part of the programme in the Historical Collections Room itself and I think this worked really well. It gave a great sense of what it’s like to be working in that room, at that temperature, with the objects themselves. I recorded my section a few weeks later and in hindsight, I should have suggested that we did this too. Instead, we spent about 20 minutes searching for a room in the Museum that was quiet enough to record without any background noise. It turns out, this is pretty difficult to do. Three rooms and three recordings later, in a random but quiet Press Office Room, Ellie had recorded about forty-five minutes of me talking about who I am, where I’m based, what my research is about, what I’ve been doing, and why this is significant for today. Beforehand, Ellie had sent me a list of questions she would ask me, and I spent lots of time preparing my answers and thinking about the best way to reflect on my research. It really made me question why researching Sloane in different ways might be relevant to someone listening to the show. I generally really enjoy presenting my research–and the wonderful thing about working with a Museum collection is the opportunity to share my work with all sorts of audiences through different public engagement activities. But I wasn’t prepared for how I would feel with a microphone under my nose while trying to talk ‘naturally’ about what I do and why this is important. It’s amazing how people involved in broadcasting make it look and sound so effortless. At the end, Ellie mentioned that experts react in different and surprising ways when asked to do similar recordings. This definitely made me feel better! By the end of the interview I had relaxed and was feeling more comfortable… and especially happy that this hadn’t been a live broadcast. I had no idea what the final show would sound like or how much of what I said would be included, but I thought that Ellie did a beautiful job of editing it. It was primarily Mark’s show, so I was really pleased to have been included as much as I was, with my interview woven through the programme in such an interesting way. Ultimately, I’m just delighted that I could talk about broadcast Sloane, his incredible collections and the research that a number of us are undertaking, to a national audience. Working with the NHM provided me with this exciting opportunity. Now, I hope, the programme’s listeners are intrigued and keen to know more about Sloane and his astonishing eighteenth-century natural history collections. Sloane was unique in his collecting habits and connections to gardens. He was passionate about obtaining plant specimens and discovering their various medical uses, however, appeared to be less interested in being personally involved in gardening. This is apparent when comparing his practices to those of his friend and colleague, Richard Richardson. Despite the growing popularity of private gardens in England, Sloane did not have a garden of his own. His method of collecting botanical specimens was to dry them and press them in books, or keep them as seeds. Many of his letter correspondents cultivated gardens of their own and experimented with acclimatizing foreign specimens to English soil. Why did Sloane assist the Chelsea Garden at its time of crisis (mentioned in first post) if he was not trying to gain access to a garden of live specimens? How did his apparent abstinence from gardening connect with his support of the Chelsea Garden for the advancement of pubic botanical knowledge? The Physic Garden, Chelsea: men botanizing in the garden. Credit: Wellcome Library, London. Richard Richardson, maintained a garden of his own at his home in North Bierley. His private garden earned a reputation as the best in North England and housed both native and foreign plants, including a hot house for growing exotic fruits. Richardson collected for his garden himself on explorations as well as obtained specimens through his associations with other private and public gardens. From his letters to Sloane, Richardson appears passionate about exotic specimens, whether it was acclimatizing them to English conditions or fabricating greenhouses to mimic their native growing conditions. This was a much different approach to specimens than Sloane’s. Richardson mentioned his garden in North Bierley several times to Sloane. It contained botanicals that even the Apothecaries’ Chelsea Physic Garden lacked. Richardson obtained plants for his personal garden from public gardens, such as the Edinburgh Physic Garden. This exchange of plants between private and professional gardens is an interesting feature of English gardens. These private collectors were also part of an exchange network with Dutch and French professional gardens. One reason was that the men who were collecting, like Richardson, had the wealth and leisure to maintain a garden and were associated with scientific societies like the Royal Society of London. Their collection of botanicals was not just for aesthetic reasons or to display their status, but their scientific functions gave collectors the authority and expertise to trade with the professional gardens of physicians and apothecaries. In a letter to Sloane dated 13 November 1725, Richardson mentioned an “unfortunate accident” that occurred to some “scotch plants” from the Physic Garden at Edinburgh which he “proposed to have brought back … for my garden.” In addition to collecting from other gardens to fill his own, Richardson mentioned also wanting to make his collecting habits useful to others by collecting plants from northern England for the Chelsea Physic Garden and Mr. Miller. Unfortunately, he ran into some difficulties in creating such a relationship with Miller. On 8 April 1727, Richardson wrote about exchanging mosses with Miller for some seeds. On 19 November 1728, Richardson mentioned receiving a list of desired plants from Miller and had been collecting what was still in season from his garden to send to Chelsea. Richardson’s attempt at a reciprocal relationship of exchange from his garden to the Chelsea public garden soon fell apart. By 16 March 1729, Richardson had stopped receiving letters from Miller. Even after a visit to Chelsea in the summer, during which Miller promised he would send Richardson a letter detailing which plants the garden was lacking, Richardson wrote to Sloane on 3 November 1729 that he had not received a letter of this sort. For some reason, unknown to Richardson, their amicable exchange ceased. (For more on relationship etiquette see this post regarding Abbe Bignon and Sloane). Richardson sought out associations with other gardens, and he demonstrated great attachment to and took great care with his own garden. It is likely that Sloane received dried plant specimens or seeds from Richardson’s personal garden that had originally come from Miller at the Chelsea Garden, given that he was recieving other dried specimens from Richardson. Other than that, Sloane’s involvement in the Chelsea garden appears to have been kept separate from his desire to collect and classify, stemming instead from his desire to expand the public’s botanical knowledge and to ensure supplies of medical specimens. Statue of Sir Hans Sloane in the Society of Apothecaries Physic Garden in Chelsea. Credit: Wellcome Library, London. The Sloane Correspondence is a rich source of information about gardening in the eighteenth century. The science of gardening at this time was a shared experience between friends and colleagues who traded specimens and cultivated their collections with great curiosity. Although gardens could be either privately or publicly managed, the collaborative aspect of gardening served many different purposes depending on the individual collectors or institutions involved. English gardens were built for multiple purposes, from personal and private pleasure gardens to university organized and maintained medical gardens. Both the Chelsea Garden and several private upper class estate gardens during the latter half of the eighteenth century in Britain were a combination of these purposes. They were both aesthetic and practical, housing rare exotic treasures to display the owner’s status as well as contained local and distant medical botanicals for practical medicinal uses. Apothecaries and physicians relied on many botanical remedies and thus needed access to gardens. This resulted in many of them becoming expert gardeners. According to a Parisian physician at the time, Jean Fernel, a competition between apothecaries and physicians inspired an invigorating cultivation of gardens with both common and acclimatized plants in order to maintain “dignity and authority” over the other. The Physic Garden, Chelsea: a plan view. Engraving by John Haynes, 1751. Credit: Wellcome Library, London. The Chelsea physic garden was originally property of the apothecaries of London, though it fell on hard times in the early eighteenth century. Physician, Sir Hans Sloane, become benefactor to the garden because he saw the value in the botanicals it provided and its potential to provide benefical botanical knowledge for the public. Sloane saw the importance of the garden for all types of medicinal use as well as for the maintenance and growth of botanical trading within England, Europe, and the newly acquired Colonies. In 1722, Sloane leased a parcel of his land in Chelsea to the Company of Apothecaries of London on the condition that they maintain the garden for “physick” and send the Royal Society fifty specimens per year until 2000 specimens had been given. The reason given for requiring the annual gift of specimens was to encourage the constant growth of the garden and to ensue it continued to be used for its proper purpose. Jardin des Plantes, Perpignan. Credit: Wellcome Library, London. French botanical collecting was tied to their colonial expansion and French collectors were most interested in botanicals with economic value. As a result of higher state involvement, French motivations were focused on economic gain rather than scientific curiosity; collecting and cataloging the world’s botanicals was less of a priority, resulting in the cultivation of different types of plants than in England, which centered on medicinal rather than economical specimens. The discussions about gardens between Sloane and many of his British correspondents did not mention any state support or involvement. Their collecting appeared to be motivated by a desire to discover all the local and exotic species and where they were naturally found. As was the case for France, English collecting in its colonies did have an economic component; however, the perceived economic value of plants was not mentioned as the primary motivator of botanical collectors. Without immediate state direction both personal and professional English gardens became significant players in the European exchange of botanicals. English private collectors and gardeners were successful at expanding their knowledge of species and contributing to scientific knowledge, while the French were successful at extracting economic value from their exploration of plants. Even though the French gardens were open to the public, the English exchange relationship between the personal collectors and the professional gardens allowed for information about botanicals to spread freely and the development of gardens across England. English gardens had perhaps less economic value than their French counterparts, but provided an abundance of natural history knowledge and practical medicinal value for its public. Harold Cook, Matters of Exchange New Haven: Yale University Press, (2007): 31. Isaac Rand, “A Catalogue of Fifty Plants Lately Presented to the Royal Society, by the Company of apothecaries of London ; Pursuant to the Direction of Sir Hans Sloane, Bart. Bresident of the College of Physicians and Vice President of the Royal Society,” Philosophical Transactions, 32 (1722). Ruth Stungo, “The Royal specimens From the Chelsea Physic Garden, 1722-1799,” Notes and Records of the Royal Society of London 47, no. 2 (July 1993): 213. E. C. Spary, Utopia’s Garden Chicago: Chicago University Press, (2000): 51. Spary, “ “Peaches which the Patriarchs Lacked”: Natural History, Natural Resources, and the Natural Economy in France,” History of the Political Economy 35, 2003: 14-41. Does Sloane deserve to be credited as the inventor of milk chocolate as he is so often lauded for all across the internet? Even the British Museum proclaims that “It was Sir Hans Sloane who introduced milk chocolate for drinking.” Unfortunately it seems that Sloane and milk chocolate is a myth with little basis in reality. Three tin-glazed earthenware chocolate cups, ca. 1740-1745. Image Credit: British Museum. Chocolate had been in use long before Columbus, with the Mesoamericans drinking a bitter but spicy chocolate drink. Following the Spanish conquest similar chocolate drinks spread to Spain and gradually began to slowly make inroads throughout Europe. It was not until shortly before Sloane’s birth in the mid-seventeenth century that chocolate began to enter the English consciousness as both a medicine and an exotic treat for the English elite. Sloane’s life witnessed an increasing prevalence of chocolate in England, although it remained a luxury. Its status as a luxury good and status symbol is underscored by the beautiful chocolate cups Sloane imported from Italy. Chocolate was thought to have many different properties, it could serve as an aphrodisiac or help with hangovers. Trade-card ‘Sir Hans Sloane’s Milk Chocolate’. Image Credit: Wellcome Library, London. But contrary to popular belief Sloane did not invent the concept of milk chocolate. In fact, a great variety of milk chocolates and even icy chocolate cream recipes had been published for the English market in the seventeenth century. Shortly after Sloane’s death in 1753 an entrepreneur named Nicholas Sanders brought Sloane’s Milk Chocolate onto the market. Sanders claimed to have an original chocolate recipe from Sloane as he battled against others attempting to purvey chocolate with Sloane’s name. Sloane’s name remained golden, so far as chocolate buyers were concerned. The famous Cadbury Company even sold chocolate under his name in the nineteenth century. And of course, there is the modern Hans Sloane Drinking Chocolate. As James Delbourgo has argued, Sloane–a rich baronet–would have had little motivation to get into such a grubby business as chocolate selling. Particularly “in an era that prized the public fiction of gentlemanly disinterestedness,” a close association with an item which had such negative, even racy connotations, would not have served his hard won image of virtue. Sloane was a doctor and as such had been known to prescribe chocolate medicinally now and again. He even appears to have enjoyed it as a treat on occasion. Sloane’s time in Jamaica had given him first-hand experience of the exotic, including the use of cocoa. His scientific publications included high quality illustrations of cocoa and he preserved a botanical specimen in his collection. Chocolate suffered a bit of a branding problem in England since first entering the market in the seventeenth century. Promoters often attempted to improve its reputation by claiming that their recipes had sanction from the high and mighty, whether a king, or like Sloane–a famed physician to royalty. In the eighteenth century, the lower classes were unlikely to consume chocolate, while chocolate took on decadent, even subversive associations in elite culture. Chocolate houses often catered to gambling (such as the famous modern gentlemen’s club White’s which was founded as a chocolate house) and on the political spectrum it included the almost-Jacobite Ozinda’s, with the Cocoa Tree serving as an unofficial Tory headquarters. White’s Chocolate House, London c.1708 coloured lithograph published by Cadbury. Image Source: Wikimedia Commons. So why does the idea that Sloane invented milk chocolate persist? Well, it makes a nice story and, once a story becomes common, it can be difficult to correct. It is an easy and compelling tale to have the first inventor of something be a famous and important person who got it right the first time… Unfortunately the attribution of milk chocolate to Sloane is no more than just another tasty myth. Kate Loveman, “The Introduction of Chocolate into England: Retailers, Researchers, and Consumers, 1640-1730,” Journal of Social History, No. 47 Vol. 1 (2013): 34-35. James Delourgo, “Sir Hans Sloane’s Milk Chocolate and the Whole History of the Cacao,” Social Text 106, Vol. 29, No. 1 (2011): 86. “I will like history more.” This was the response from one of the schoolchildren I worked with on a project about Sir Hans Sloane. He had been asked how the project would change what he will do in the future. This boy had been difficult to engage and had struggled with reading primary sources. He had done his own thing when we were doing designing activities, and he didn’t even want to go to the celebration event at the end of the project. But it meant a lot when I read his feedback, and that is what he said. It made my day. I highlighted this response in the evaluation report I sent to the UK Heritage Lottery Fund, which had provided the money for the project. Healing Histories took place over the academic year 2011-12 and, as project coordinator, I was based in the London Borough of Camden‘s School Improvement Consultancy Service. I worked with students from two secondary (high) schools on a debating project about herbal medicine and with another primary (elementary) school class on designing and planting a physic garden in Bloomsbury Square. The physic garden in Bloomsbury Square. But the most challenging and exciting part of the project was to get a class of twenty-four Year 5 pupils (aged 9-10) to research, write and design a trail leaflet about Sloane in Bloomsbury. St Georges Bloomsbury with a statue of George I on top of the steeple. Sloane lived at 3 and 4 Bloomsbury Place (then Great Russell Street) from about 1695 to 1742, and his collection was, of course, the basis of the British Museum. Through their research (prepared in advance by a freelance historian, Katie Potter), the kids found out that the Duke of Bedford had a house north of Bloomsbury Square and that there had been a market south of Bloomsbury Square when Sloane lived there. They also found out that he had been a vestryman at St George’s Bloomsbury, which was a new church, opened in 1731. We also had a professional writer, Dr Michael McMillan, who helped the kids get into the research through poetry and drama. The pupils really enjoyed dramatising major events in Sloane’s life, like his trip to Jamaica and meeting the ex-pirate Henry Morgan, and the attempted arson attack and burglary at his house in 1700. Michael also challenged them to do the best writing they’d ever done. It really worked. They wrote a day in the life of Hans Sloane as he went for a walk around his local area. The final trail as researched written and designed by 10 year olds. Then they designed the leaflet itself, with the help of Sav Kyriacou of digital:works. I found some pictures of Georgian interiors for them to use as a guide to creating a colour swatch for the leaflet, and we did a very basic and fun cut and stick activity with all the elements we needed on the trail. The trail was launched at a great day in Bloomsbury Square, and the Mayor of Camden attended, as well as Sir Hans Sloane himself (well, an actor)! The pupils had prepared part of the trail as a walking tour and gave it to pupils from another school. Then, as one final treat, I had organised for them to go into 4 Bloomsbury Place, one of Sloane’s houses. He had originally moved into number 3, but as his collection grew he needed more space so leased the house next door as well. Various businesses are now housed in that same building and two of them let us look around, including Prestel Publishing, who gave the pupils access to the roof! We found so many sources and stories for the children to work with, including Old Bailey records of the attempted burglary and other crimes in the area, vestry records at St George’s Bloomsbury, and accounts of Handel leaving a buttered muffin on one of Sloane’s priceless manuscripts. There were all of his c.80,000 collected objects in the British Museum, British Library and Natural History Museum to look through, too. Sadly, we didn’t find the correspondence, which now fills me with regret! The pupils got a lot out of the project, though. They looked at an array of historical sources, which the teacher has packaged up to use as a topic with subsequent year groups; they became amazingly confident in their writing; they contributed something to their local area; and their hard work was rightly celebrated. There was something special about Hans Sloane that kept their interest. He led a fascinating life at a fascinating time in history, meeting pirates, Samuel Pepys, Handel, Linnaeus, and kings and queens. He was a high-achiever from a relatively modest background–and William Stukeley described him as not being able to speak in public at all. He had a tangible impact on the local area, with the British Museum standing as a testament to his collecting zeal. He popularised milk chocolate and he had a stuffed giraffe in his living room (both winners with kids). Sign on the pavement outside the British Museum during the Olympics. I have moved on to pastures new, but later this term the pupils who were involved in this project will do a series of talks at neighbouring schools to tell their peers what they have done and what they found out. Copies of the trail have been sent to every Camden school with ideas for teachers to incorporate them into their history or English classes, and the trail is being given out at the British Museum. So if you’re in London and you get a chance, go to the information desk in the Great Court and ask for a copy, then take a stroll round eighteenth century Bloomsbury through the eyes of Sir Hans Sloane. Until then, you can download the trail from the British Museum website. Kim Biddulph trained as an archaeologist and now works as a museum educator. She coordinated two projects for the London Borough of Camden to engage children and young people with the heritage of Camden, an area of central and north London. Healing Histories was the second of those projects, funded through the UK National Lottery and it aimed to explore the heritage of Sloane, who lived in the borough for over 40 years. Kim also blogs at Archaeotext.